About three weeks ago I bought two female fancy mice from the local petshop. They have a very large cage equipped with toys, houses etc. They seem very happy and get along very well. The only problem I have is that one of the females is extremely aggressive. To the point where I could be walking past the cage and... show more About three weeks ago I bought two female fancy mice from the local petshop. They have a very large cage equipped with toys, houses etc. They seem very happy and get along very well. The only problem I have is that one of the females is extremely aggressive. To the point where I could be walking past the cage and she tries to bite me. She's drawn blood many times and I respond by gently giving her a little flick not to hurt her but to try and teach her that it's not ok to bite. I never try and grab them. The most I do is lay my hand palm up with they're favourite food in the middle to let them get accustomed to me and crawl on my hand on their own accord. I always wash my hands before handling so they don't smell of food and I never feed them with my fingers or put my finger any where near them. It's gotten to the point where even if I'm filling up their food she will race down from the third story of her cage and try and bite my wrist or fingers. She will even race at the bars of the cage if she sees me walk past and if I'm close enough will try and bite me. Unfortunately it's gotten to the point where I'm scared to even clean their cage and the other female (whom I never had a problem with before) is beginning to bite. I spent over $100 on a fully decked out three story cage and toys and food and treats and I love my mice but it's gotten to the point where I'm afraid I'll have to get rid of them. This is my last chance. Although this behavior can be territorial, it is most common in male mice. I think you should purchase a pair of leather gloves and continue offering the mouse treats when you handle her. If you have been putting her down immediately after she bites you, she has already learned that biting ends handling. You will be able to teach her to behave with rewards and the gloves. This is really not normal, not even for wild mice. I would say fear, but this is different. Perhaps learned on its own that this behavior, you leave it alone. Perhaps your mouse is one of those that needs to live alone, this can be especially true for males. Having a cage mate simply keeps it in stress and never settles or tames. I have seen females going to have pups, behave a bit aggressively if kept with other mice, not this extreme and a pregnant mouse, you would know by now. This strange,I couldn't rule out some medical condition, brain tumor perhaps. I have had over a dozen mice in my day, none were anything like this and of all my rodents only one rat that liked to nibble a bit too hard but still no blood. You might try keeping her single and effectively start from the beginning with the settling, the taming and training. I had one hamster that never liked to be picked up at all, and a squirrel I had for 13 years was a biter. wouldn't attack,but trying to pet or touch it, it would bite. It would take treats and food through cage bars without biting, that he trusted. 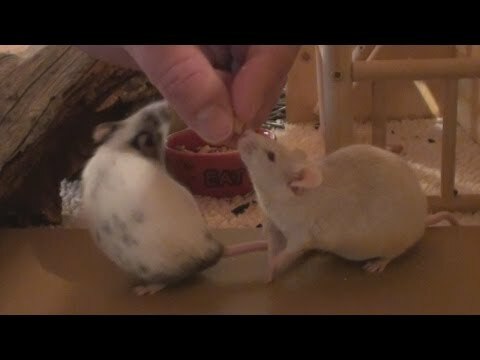 If your mouse will take treats through cage bars, that does show them hands can be something good. wait you never grab them? what do u mean by that? like u never pick them up to bond with them. if so thats a big part of the problem. they need to be played with. u need to bond with these animals or they will turn aggressive. also flicking in the nose? not a smart idea. it teaches the animal nothing and it also leads them to hate u and be aggressive to you. no wonder why she bites! u are giving her negative attention. who wants to bond with someone who always flicks them in the nose? never hit or flick animals. dont blow in there face dont do any of that. take them to the vet and make sure nothing medically is wrong with them. stop flicking the mice and start being nice to it. bond with it. then she will start to trust u again. My Pet Mouse is Really Sick. Help? Help! Pet mouse missing her whiskers!? Help! My pet mice don't get along!? I need info on pet mice, can anyone help me? Will neutering my pet mice help their "mousy" smell go away? 2 female mice acting aggressive towards a female baby mouse! ?